the Stoic at once sets aside all such dualistic ways of describing the life of the soul. To him the dominating self is at once reason and will. And though, as we shall see, he lays great stress upon the division and conflict of the moral life, yet he will not for a moment allow that desire and passion are other than forms of the life of the one self, or expressions of its self-determined activity. This point is apt to be misconceived, because we frequently find Stoics speaking of the passions as unnatural or irrational. Such language might seem to involve a similar point of view to that of Plato, when he distinguishes the rational and the irrational elements in our being, or to that of Aristotle when he says that the desires are partly irrational, though so far participating in reason as to be capable 'Vol* I, p. 316'¿eg. Now I think that from one point of view this doctrine marks a distinct advance upon the psychology of Plato and Aristotle. It is true, as I have already indicated, that it leaves out of account the process of development by which the implicit unity of man's nature becomes explicit; in other words, it forgets that, though reason makes man what he is, he is ever becoming, and has never become completely rational and self-conscious. But it forces us to realise that the germinal reason is in him from the first, that it is the distinctive principle which constitutes. his selfhood, and that, if there were not, even in his most undeveloped stage such an expression of the unity of the self, there would be in him no self, and, strictly speaking, no humanity at alL Even in the consciousness of an animal there is such a universal unity, that it would be absurd to treat * See Bonhtfflfer, p. 93.
its different appetites as isolated or standing in merely external relations to each other. The animal at least feels itself in all it feels, and this gives an individual unity to its life through all its changes. Yet as this unity in the animal is not self-conscious, the animal might still be said to live wholly in the present, and to pass from one impression or impulse to another, not relating or connecting them, but identifying itself wholly with each in turn. But a self-conscious being cannot live thus, just because it is self-conscious, or, in other words, because it refers all its action and passion to one ego. * To forget, in considering him, this essential reference, is to leave out the unity which gives its distinctive character to his life, and then to treat the whole as if it were the sum of the parts, or the result of their action and reaction upon each other. On the other hand, if we do take account of this unity at all, we must realise its presence in all forms and changes of the soul's life. Perhaps we may put the truth more exactly by saying that the life that is self-conscious has in it both a new kind of unity and a new kind of division; for in such a life the self is necessarily set against the not-self— at once distinguished from it and essentially related to it—and this division, as well as this unity, is carried out in all its conscious states. But this means that in it sensation becomes perception, and appetite desire. Hence, If in one sense we may be said to start "with 'the feelings and impulses of animals, yet'the very dawn of our rational life carries us beyond them, so that we never are simply sensitive or simply appetitive. In other words, our sensations and appetites are never what they are in the animal; they may be better or worse, higher or lower, but they are never the same thing. 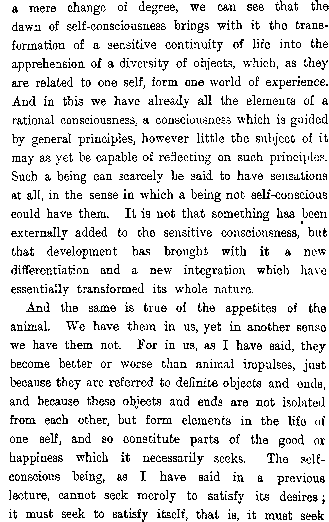 Our sensations may often be less keen in themselves than those of some animals; but they are subject from the earliest dawn of consciousness to a new interpretation, being referred to objects whieh are conceived as standing in definite relations to each bther in the one world of experience which exists for one self. And they have become capable, because of the new meaning whieh is thus put into them, on the one hand, of conveying to us general truths which are beyond the reach of animal capacity, and, on I lie other hand, of deceiving and misleading m in a way and to a degree in which the comparatively simple nature of the animal can never be deceived or misled. the particular end or object as part of a general good. And, though it is possible that for the moment these two things may seem to be identical, and the soul may throw itself with all the energy of passion into one pursuit, such a concentration must in the long run lead to a recoil. For it is impossible that a rational being should permanently identify the good with one element in it, or that he should live wholly, like the animal, in each impulse as it arises. There may be an approximation to this in a low stage of humanity; but, even then, there is a restlessness and .dissatisfaction which indicates that the universal good, the end which a self-conscious being as such must seek, is separating itself from the particular objects in which it has been sought. A self-conscious being, as such, necessarily has the consciousness of itself in relation to a world, and its complete satisfaction cannot be less than to have its world for itself. This limitless self-seeking is the background of all the desires of a self, and it infuses into them all an element which may either exalt or degrade them, but which in any case cannot let them be like the simple and direct impulses which come with a definite physical need and pass away immediately with its satisfaction. The appetites of man, if we may call them so, are capable of being overstrained and perverted in a way that is not possible in the animal life, just because in them he seeks the satisfaction of a self, and tries, as it were, to expand a finite into an infinite good. And, on the other hand, they are capable of being purified and idealised by being made the natural basis of a higher spiritual satisfaction, elements in that comprehensive good which alone can be regarded as adequate to the self. It was, therefore, a very imperfect psychology which led Hume, as it has led many, to speak of the passions as if they had an independent nature of their own, which reason could not alter. On the contrary, we have to realise that, from the beginning, reason enters into the constitution of the desires, giving even to the simplest of our appetites a character which they could not have except in a rational being, and continuously transforming them by the idea of the good as the realisation and satisfaction of the self. For, as Plato declares, man necessarily seeks the good, "having an antici-pative consciousness of its nature," which gradually becomes clearer and more comprehensive with every step in the widening of his experience and the development of his powers. Hence, whatever may be the explanation of that division in man's life which we ordinarily speak of as the conflict of reason and passion, we must recognise that it is a conflict within our rational nature, between different expressions of reason, and not between reason and something else. In insisting upon this point, therefore, the Stoics hitj upon a truth which was obscured or neglected in the Platonic and Aristotelian philosophies. For it is the essential problem of human life that we can thus be divided against ourselves, in spite of the identity of the self of which we are conscious. The division and conflict of the soul, indeed, would not be so deep and deadly, if it could be explained by the opposition of matter to form, of sensuous passion to an ideal principle, and if it were not that the ideal principle in us is turned against itself. That the passions of men mislead them is the superficial aspect of the fact, but the deeper aspect of it is that we mislead ourselves; for the passion that misleads us is a manifestation of the same ego, the same self-conscious reason which is misled by it: and thus, as Burns puts it, it is the very " light from heaven " that leads us astray. We always seek the good, hut frequently we mistake something else for it, and, when this happens, we commonly say that our passions mislead us. But such passions are really the result of false judgments, in which we subsume under the idea of good actions or objects that are not good. And this again implies one of two things; either we make a mistake as to the idea of good itself, or we make a mistake r as to the nature of the things which we subsume under it. In other words, either we do not clearly realise what we mean when we call a thing good, or we do not clearly perceive what the particular thing in question is, and, therefore, we suppose it to have a character which it has not. What is the chief good to stoics?